Kito+ is a simple yet sophisticated health tracker according to the press release and comes with a built in a modular form so it can easily integrate into your phone case. Through simple touch, Kito+ reads your vitals within seconds so that you are able to track your health without interrupting your life. It allows you to store readings for future access and share not only with your family but enables you to provide invaluable information to your doctor. Through quick and easy health tracking, Kito+ empowers you to make smarter lifestyle decisions to lead a healthier and happier life. Kito+ has been designed to fit in to a custom designed iPhone case giving you immediate access to tracking your health at home, in the office or on the move. With a simple touch and within seconds, Kito+ measures your heart rate, respiration rate, blood oxygen, electrocardiography (ECG) and skin temperature. Kito+ is designed in a modular fashion and comes with a sensor unit embedded into custom-designed cases that are included and are compatible with iPhones 6, 6 Plus, 6s and 6s Plus. 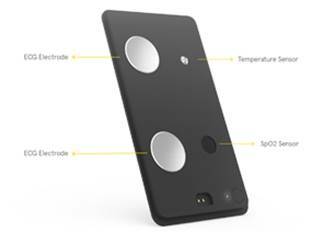 The sensor module itself, can also be used as a standalone device with both iPhone and Android phones. Kito+ is available, priced at £99.99 from Azoi.com and the Kito+ app can be downloaded for free from the App Store and Google Play.